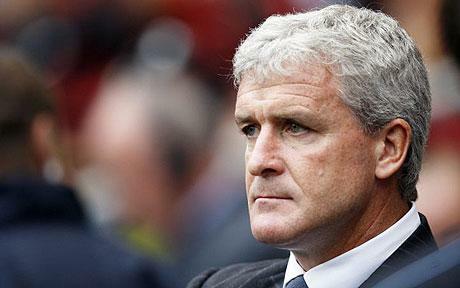 After failing in their bid to secure the services of Martin Jol from Ajax, last week Fulham announced the appointment of Mark Hughes as their new manager. Jol had appeared strangely keen to leave a team that has won the European Cup four times for London, though, as always, money probably played a part in his deliberations, as the famous Amsterdam club has become a selling side, while Fulham, though not the wealthiest, do have transfer funds available. 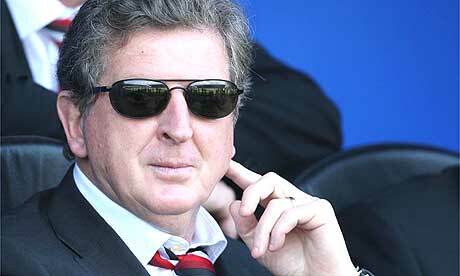 Having been appointed halfway through the 2007/08 season with Fulham in the Premier League relegation zone, Hodgson rallied his team sufficiently for them to evade the drop, before leading them to an impressive seventh place the following year, which secured European qualification for only the second time ever. Last season was arguably the most successful in the club’s history, as they finished in a comfortable mid-table position in the Premier League, got to the quarter finals of the FA Cup and, most thrillingly, reached the final of the Europa League, where they only succumbed 2-1 to the more highly regarded Atletico Madrid after extra time. 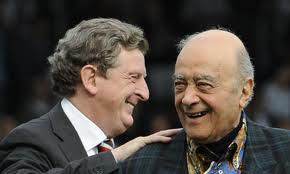 Even though Hodgson’s role has been pivotal to Fulham’s recent achievements, he is not the most important man at the club: that description applies to the chairman, Mohamed Al Fayed, who has bank-rolled the team’s amazing rise. On buying Fulham in 1997, the then owner of Harrods, London’s world-famous department store, brashly stated that he wanted them to become the “Manchester United of the South”. This has not quite come to pass, but the club’s transformation has still been remarkable. Al Fayed also pledged to take the club from the old Division Two to the Premier League in five years and they actually achieved that in one year less, winning two divisional championships en route to the top tier. Obviously much of the credit for the club’s progress must go to the players and various managers, but it is difficult to believe that Fulham would have reached these heights without Al Fayed’s continual funding over more than a decade. Although not possessing the riches of Roman Abramovich or Sheikh Mansour, he is estimated to have a £650 million fortune, which places him 94th on the Sunday Times Rich List and has enabled him to finance the football club. 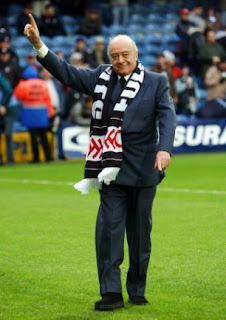 It is clear that Fulham fans owe Al Fayed a great deal – quite literally, in terms of the club’s debts. As at 30 June 2009, Fulham’s gross debt stood at an enormous £207 million, which is the 5th highest in the Premier League, only behind the so-called Big Four. However, only £12 million of this debt comes from commercial bank loans with the vast majority (£196 million) owed to the owner via a number of group companies. Al Fayed’s generosity is highlighted by the “soft” nature of the debt with the £183 million loans from the parent company being interest-free, which really helps the club’s financials. The £12.6 million loan from Harrods (UK) Limited did attract 7.11% interest, but this was repaid in August 2009 (after the accounts were published), as was £4.8 million of bank loans. More worryingly, £25 million of additional funding was obtained from third parties after the year-end, partly secured on future broadcasting rights and a second charge over the assets of Fulham Stadium Limited, though nearly £10 million of this has already been repaid. Fulham’s ownership might appear complex with their financing coming from an ever-changing list of companies, but it’s really quite simple with the money effectively owed to Al Fayed. In the past, the owner used to support the club through loans from Harrods, but these have all been repaid and replaced by loans from Fulham’s parent company, AIT Leisure Limited, which is incorporated in the British Virgin Islands, and its previous parent company, Fulham Leisure Holdings Ltd. The ultimate parent undertaking is Mafco Holdings Limited, a company registered in Bermuda, which is controlled by the Al Fayed family. 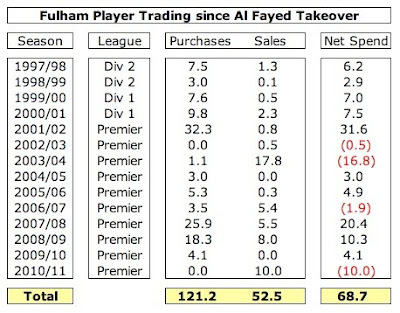 People may have doubted Al Fayed’s motives when he paid £30 million to purchase Fulham, but he has since invested well over £200 million into the club, first in order to get the club into the Premier League and second to keep it there. 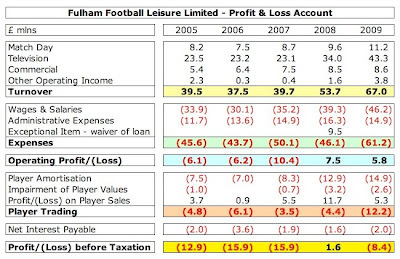 The importance of this funding is evident when examining Fulham’s financials. The stark reality is that Fulham simply do not make profits. In the last five years, they have only managed to once report a profit – and that was due to some nifty accounting in 2008 when they booked the waiver of a £9.5 million loan as a cost credit. Without including that exceptional item, there would have been another loss of £8 million. Otherwise, it’s a sea of red ink. Not only do Fulham report losses, but they’re also relatively high compared to the turnover, e.g. they recorded losses of £16 million in both 2006 and 2007 on a turnover of less than £40 million. Even though revenue has significantly increased over the past five years from £39.5 million to £67 million, largely due to the growth in broadcasting income, the club has not really improved its underlying financial position. The higher Sky television deals have only managed to contribute to smaller losses. The problem is that much of the revenue growth has been used to increase player wages and buy new players in order to give the club the best chance of surviving in the Premier League, which, in fairness, is completely understandable. Fulham have managed to achieve an operating profit in the last two seasons, but this has been more than eaten up by player trading. The situation would have been even worse without Al Fayed subsidising the club by not charging interest on the loans. If the club had to pay a commercial rate, this would increase the interest payable (and losses) by around £10 million a year. Given the size of Fulham’s turnover, they are bound to struggle financially. If we look at the revenue of the clubs who finished in the top ten in the Premier League in 2008/09, we can see that Fulham are rock bottom with just £67 million, which is at least £10 million lower than every other team. In particular the match day revenue of £11 million is painfully small, while the low commercial revenue of £12 million is actually inflated by including £3.8 million of unexplained “other operating income”. The real commercial revenue is tiny at just £8.6 million. Obviously, money is not the only factor in a club’s success, which can also be driven by old-fashioned positives like good coaching, tactics, developing players and team spirit, but it sure makes life easier. As with many other clubs of this level in the Premier League, it’s all about the TV money with Fulham earning nearly two-thirds of their income from this revenue stream - £43 million out of the total £67 million. Despite this, Al Fayed believes that clubs like Fulham should receive even more from the central pool. Not only does he think that the total deal should be higher, describing those responsible at the Premier League as “donkeys who don’t understand business”, but he thinks that the distribution method favours the big clubs. Less obviously, they are also reliant on how many times Sky deign to broadcast their matches live, which accounts for the remaining 25% of the domestic rights. The more a team is shown live, the higher the share of the facility fee. Each team must be broadcast a minimum of ten times a season with a maximum of 24, but this tends to benefit the big clubs. For example, in each of the last two seasons Fulham have been shown the minimum ten times, while we have had the pleasure of watching Manchester United the maximum 24 times. The difference in revenue? Nearly £7 million. According to the latest accounts, the club’s “commercial activities continued to grow”, but there is precious little evidence of this driving significant growth with revenue still well short of £10 million – considerably lower than other clubs. 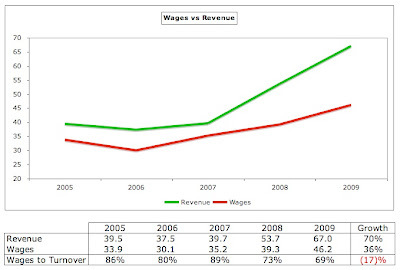 As a comparison, Arsenal earn £48 million commercial revenue and they are usually considered as laggards in this area. Nevertheless, there are small signs of improvement here with a new sponsor and shirt supplier being announced for next season. FxPro, the global broker, has signed a three-year deal for over £4 million a year, replacing LG Electronics, who only paid £3m a year. Similarly, Kappa has replaced Nike as kit supplier for the next three years. Bizarrely, Fulham also have a joint marketing arrangement with the Boston Red Sox baseball team, but I can’t see that bringing in much income. Nor can Fulham look to gate receipts for big bucks. Even though it’s been increasing, match day revenue is particularly low at £11 million. In comparison, clubs with substantial grounds like Manchester United and Arsenal generate over £100 million, but even other mid-size clubs earn over twice Fulham’s revenue. Of course, Craven Cottage is one of the smallest grounds in the Premier League with a capacity of only 25,478, but even this is not filled to capacity every week, so discounts are sometimes offered. Although attendances have been steadily rising from the 19,800 average in season 2004/05, there was a slight dip last year to 23,900, which means a 94% utilisation – the lowest of all Premier League clubs in London. Fulham actually have planning permission to expand their ground to 30,000, but it is far from certain that they would be able to fill it. As other clubs have noted to their cost, the “Field of Dreams” approach (“build it and they will come”) does not always work. In fact, despite its picturesque setting, Craven Cottage has given the club a few headaches in the recent past, most notably when they were promoted to the Premier League and they were forced to ground share at QPR’s Loftus Road, while their own stadium was converted to an all-seater. There would be other difficulties in expanding the ground, most notably its proximity to the River Thames, but the great views offered by this attractive location make it a highly desirable piece of prime residential real estate. Indeed, many suspected that Al Fayed’s motive in buying the club was to develop luxury riverside apartments. This view was given greater credibility in 2002 when the club agreed to sell the ground to a housing developer, Fulham River Projects, for £50 million, though the deal ultimately fell through. It was later explained that the club desperately needed the £15 million deposit at the time, after Harrods suffered a poor year’s trading, meaning that Al Fayed could not make his usual cash injection. Although it now looks like the club want to secure their long-term future at Craven Cottage, the ground’s freehold is still one of their principal assets. Valued in the books at £22 million, it is clearly worth more than that. Given the £50 million price agreed eight years ago, a conservative estimate would be £60-70 million. The other important assets are the players (a.k.a. intangible assets), which are valued at £31 million, though would almost certainly realise more on the open market. The club also has a substantial deferred tax loss of £44 million, which is no use to Fulham, so is not recognised in the accounts, but could be useful to a future purchaser. The horrible truth is that the only way that any financial value could be realised is from the sale of these assets and no fan would be in a hurry to sell off the players or the ground. Even so, the club still has net liabilities of £166 million, up from £115 million in 2004, a sign that the balance sheet is steadily deteriorating over time. "Turning the world upside down"
The other expense that has been growing over the years is player amortisation, which is the annual cost of writing-down a player’s purchase price. For example, Damien Duff was signed for £4 million on a three-year contract, but his transfer is only reflected in the profit and loss account via amortisation, which is booked evenly over the life of his contract, i.e. £1.3 million a year (£4 million divided by three years). Thus, the total cost of player purchases is not immediately reflected in the expenses, but increased transfer spend will ultimately result in higher amortisation. In Fulham’s case, it has grown from £7 million to £15 million, but this is still way behind their big-spending neighbours Chelsea with £49 million. Interestingly, Fulham are one of the few clubs that explicitly include impairment losses for reducing the value of some of their players, which has cost the club almost £7 million over the last three seasons. As stated above, the implication of the growing amortisation is that Fulham are a buying club and this is confirmed by their net transfer spend of almost £70 million since Al Fayed’s takeover, though the activity has been sporadic. Although the expenditure might seem low in the early years, it was in fact very high for the lower divisions, but it only really took off in 2001 on the club’s promotion to the Premier League, when they splashed out £32 million. Lawrie Sanchez was also given strong backing in 2007, when he bought Diomansy Kamara and what seemed like half of the Northern Ireland team, as was Roy Hodgson to a lesser extent in 2008. The sale of Louis Saha to Manchester United for £13 million in 2003 lead to that year’s net surplus, but not many appreciate that these funds were needed to help repay the £15 million deposit (plus interest) that Fulham had received the year before as part of the proposed deal to sell their ground for housing development. Incidentally, that central London location surely helps Fulham in the transfer market when recruiting players from overseas. Unfashionable clubs in the North of England often have to pay a premium to tempt the same players away from the capital. 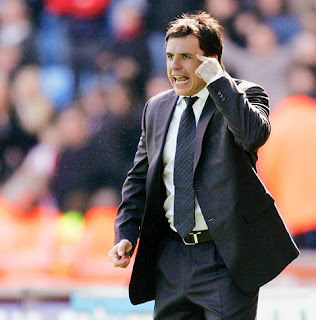 "Coleman's mind games were not enough"
There you have it: a perfect summary of the issue facing clubs such as Fulham. In short, they cannot afford to be relegated. This is why they will apparently over-spend on transfers and wages in order to avoid that risk becoming a reality. It is also why owners are ruthless with their managers, if the threat of relegation rears its ugly head. When this has looked like a distinct possibility at Fulham, Al Fayed has not hesitated to act, dismissing Jean Tigana, Chris Coleman and Sanchez, even though the first two had achieved their fair share of success. Such clubs have become addicted to the Premier League’s drug of choice, namely TV money, and in particular the tempting prospect of increasing money with every three-year contract. As we have seen, Fulham’s chances of making more match day income are slim, and even though their commercial prospects have been enhanced by last season’s exposure, this is really a drop in the ocean. No, they need the television riches, especially now that they will further increase next season on the back of far higher overseas rights, which will mean an additional £10 million per annum for each club. How much of that extra revenue will find its way to the bottom line is unclear. If past experience is any guide, much of it will end up in the players’ bank accounts via higher wages. This is why Al Fayed has to keep pumping money in, which we can see by looking at the cash flow statement. Before financing, the cash flow is negative every single year and has to be compensated by the owner. The club makes no bones about this in the accounts, “The Group’s main sources of finance, for operating losses, working capital and capital expenditure (including player transfers) in excess of funds generated internally, are interest-free loans from its parent company.” Thankfully, the accounts also state that the club has received assurances from Al Fayed that continued funding would be made available, if required – even if the team is relegated. This support remains crucial to Fulham’s future prospects. Indeed, in both the 2006 and 2007 accounts the auditors cast doubt on “the group’s ability to continue as a going concern”, specifically noting the “significant losses” and “significant deficit of shareholder funds”, while stressing the importance of the parent company’s financial assistance. Matters have since approved in the auditors’ eyes, presumably due to the higher revenue and the debt restructuring, but these clauses do highlight Fulham’s dependence on the chairman. Fortunately, Al Fayed has proved to be one of the Premier League’s most indulgent owners, seemingly happy to sink money into the club year after year, but there has to be a nagging concern over what would happen if he were to walk away. He appears perfectly happy with the club at the moment, but he could get bored, run out of money, emigrate to Switzerland (which he has already done once after a dispute with the Inland Revenue) or even die. Although apparently as energetic as ever, at 77 years old, Al Fayed’s not getting any younger. Fulham is in many respects the typical benefactor club and could be plunged into financial chaos without Al Fayed’s backing (for whatever reason), unless they could find a similarly big-hearted owner to replace him. Over the years, Al Fayed has been a somewhat controversial figure. He waged a lengthy campaign attempting to prove that Princess Diana and his son Dodi, who died in a Paris car crash in 1997, were murdered as part of a conspiracy. Despite living in Britain for decades, his applications for a British passport have repeatedly been turned down, possibly because of his long-running feud with The Observer chairman, Tiny Rowland, who battled him for control of Harrods. "So near, yet so far"
Ironically, Al Fayed recently cashed in on the Knightsbridge store, when he sold it to Qatar Holdings for a reported £1.5 billion. After repaying bank loans of £625 million, he received net proceeds of around £900 million. Despite this dramatic change in his lifestyle, he was anxious to re-assure the club’s supporters, “It all remains the same at Fulham. Fulham is not being sold.” This was re-iterated by one of his spokesmen, “Just because you sell your house doesn’t mean you will sell your car.” Nevertheless, there has to be some concern that without his cash cow, Al Fayed will at some stage stop putting money into the club. 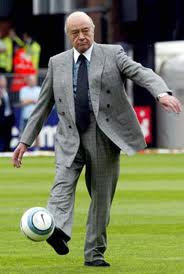 However, Al Fayed has frequently expressed his commitment to the club, albeit sometimes with more than a touch of hyperbole, “I own the best club in the world with the best team and the best fans. If anyone thinks I’m not committed to the game, or to Fulham, they’re wrong.” As he more prosaically explained last season, “I have nurtured my club lovingly for nearly 12 years, and I don’t plan to give it up.” And that’s the point – nobody could accuse Al Fayed of being a “here today, gone tomorrow” investor. He has been a committed owner, demonstrating real empathy with the fans. Moreover, his sons, Omar and Karim, are both active members of the Fulham board, and his attachment to the club must have been boosted by last season’s displays. So what next for Fulham? In the short-term, Mark Hughes has inherited an ageing squad with many key players nearing the end of their contracts, so may face a rebuilding challenge. Expectations among fans are very high after two successful seasons, but the club should probably be realistic in the transfer market and aim for mid-table security, rather than shooting for the stars. What we can say with some certainty is that Fulham have been transformed under Mohamed Al Fayed’s vision and leadership, not only rising all the way to the Premier League, but also managing to flourish there against all the (financial) odds. Despite achieving this with the help of Al Fayed’s significant investment, they have somehow managed to do it without making enemies along the way. Maybe money can buy you love after all. Excellent post. I think its safe to say Fulham are the majority of football fans' second team. However it will be a shame when the income from MAF will dry up - I hope they are self sufficient by then...at some rate. Great post as usual, I really do like thinking that I know about the finances of Premier League clubs. Wages is by far the highest element of any football club's costs, but there are other expenses that should also be covered by revenue. If the wages to turnover ratio is 70%, that leaves 30% of turnover to cover all other costs, which is tight, but achievable. Any higher, and you are virtually guaranteeing losses. If this carries on for many years, the business model is clearly unsustainable - unless the owner/benefactor pumps money in. I salute you. In various guises over recent years I have made my own attempts at something like this, but you have decisively trumped them. In particular, you have made proper sense of the transfers dimension. At such juncture, in Al Fayed's lifetime or otherwise, as money eventually changes hands, the price for the club will need to be fixed by holding a moist finger to the wind. Rationality won't come into it, will it? Even ignoring the sporting dimension and just buying for the real estate, there's a 50 million pound-ish variance according to expectations of what one might eventually (after years of acrimony) be allowed to do with the place. Hard-headed business types on the make won't be encouraged by your piece to apply. Another semi-billionaire out for some fun seems the best hope. While I may be the first Fulham supporter to have traced you to here, there has been much appreciation on a couple of messageboards. With most football clubs, it is difficult to see how businessmen can make a decent return on their investment from a purely financial perspective. Fulham have been lucky with their owner/benefactor over the years. Having said that, it is possible, as we saw with Gold and Sullivan at Birmingham. Also, the advances in technology may damage the TV revenue stream, but open up new possibilities in the internet world. Live football is a precious commodity that is one of the few pieces of "content" that has maintained its television audience, when most other programmes have seen declines. Congratulations on being the first Fulham fan to find your way to my humble blog. I hope that you are the first of many! Thank you very much for the response. The figure has been mentioned in a number of your posts on club's finances so it's good to know why it is so important. The only other person I know who has been able both to get to grips with Fulham's finances and explain them cogently is Peter H, so the praise from him above is indeed high praise. You write as if you are a Fulham supporter with a deep understanding both of the club and the finances. I'm particularly pleased that you highlighted the fact that without the sale of Louis Saha in 2003 - which to this day rankles with many fans - the Fulham River Projects deposit could not have been paid off. The club could still be playing at Loftus Road or some other anonymous stadium were it not for the Saha money. Thank you once again for an illuminating read. I'll head off to look at some of your other pieces now. Brilliant as always. Your insight into the financial aspects of football clubs helps put so much into perspective. I am biased but it seems to me that Arsenal is the only club with a totally sound business model in the EPL. MUFC and Liverpool profitable but sadled with debt, Tottenham like their suppoorters living in a dream world and the likes of Blackburn and Fulham totally dependent on TV money or a rich benefactor. Take either away and what then. This transfer window is so very slow with the exception on Man City, maybe clubs have at last woken up to reality. Even Harry R has only been talking of buying rather than spending so maybe Spurs will survive his tenure after all. Please keep the blogs coming always well worth waiting for. Perhaps you could circulate them to the sports editors in Fleet Street and then the clowns who write such rubbish about footbal finance would learn something. I hadn't fully appreciated the obvious flaws in the benefactor system that has become the modus operandi at Craven Cottage, perhaps because Al Fayed has, as you point out, always expressed such a strong commitment to the cause. Clearly, if he were to sell up (or die) in the near future it would have negative financial consequences for the club. With that in mind, how involved are his sons in the day-to-day running of the club? Would having one of them step in to take the reigns be a viable option? I had not realised that - thanks! I would like to take a look at Dutch football (Ajax in particular), but I'm not sure how readily available the information is. I'll do some digging. Thanks. I am actually in contact with a couple of sports editors, but, in fairness, my articles are almost certainly too detailed for the mass media. We shall see. I have seen conflicting reports about how involved his sons are: some say that they are very involved, while others say that they are not interested at all. I think the issue with the Al Fayed family is whether their continuing involvement is compromised by the Harrods sale. At the moment, they have a lot of funds from this transaction, but it does mean that their regular dividends have stopped. My sense of their poor commercial and marketing management (long queues with number of concession stands closed; useless ticketing staff, mediocre web site, etc.) probably stemming from having rich sugar daddy owner. On the flip side I enjoyed the small stadium atmosphere feeling as if you were really close to the players and the action, the wonderful and unique river side location, and for me the very easy commute! Based as I am near Surbiton, it was a spur of the moment decision at 2pm following a conversation with my local greengrocer earlier that morning when I learned who Fulham was playing. With season tickets starting at £300, it would be cheaper only going to five matches against the top sides vs five at Arsenal. Plus season tickets are still available. My conclusion, allied to your financial insight, is that FFC exists solely for the owner's ego. The paucity of other commercial revenue smacks of a club neglecting opportunities such as corporate entertaining in one of the world's richest cities in one of London's more expensive neighbourhoods. Which is why it makes me laugh when Al Fayed accuses others of not understanding business. The magnitude of what will happen if/when the TV moeny dies out will be astronomical. It's really hard to see how most of the EPL teams will be able to survive when it happens. To Anonymous of 9th August....Attending a pre-season friendly in the middle of the holiday period is revealing, but not frankly to the extent that your post implies. Maybe you'll return for the real deal, albeit a s/t will cost 25% more than the figure you quote and more typically 50%-100%. The size and nature of the stadium does impose restraints, about which I am not about to grumble as a member of the campaign to return us there 7 years ago. Doubtless these constraints could be more effectively overcome, there could be more corporate entertaining and so on. Still, income generated in situ would continue to be closer to that of the other prem clubs who have 25-ish stadia than to Arsenal's, even with you on board as consultant. Other drawbacks...the club lacks a catchment area it `owns', to an extent possibly unmatched in any division. It has a historic fanbase the size of the capital's Championship clubs, with 1.5-2.0 generations of newcomers largely lost in the interim between top flight relegation in 1968 and return 31 years later. There is progress and it could be more rapid. Better merchandising would certainly help. 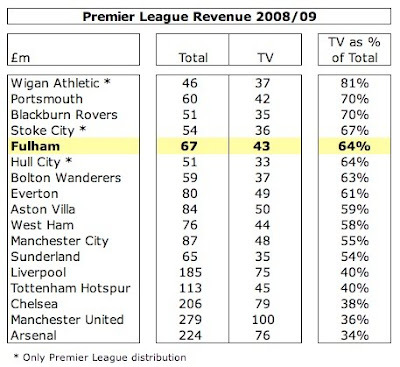 But look....even Aston Villa had TV income as 59% of its total compared to Fulham's 64%. If Fulham exists merely to satisfy its Chairman's ego, then the cutoff point presumably exists just above Everton on Swiss Rambler's list and takes in a quarter of the division. And Manchester City can now surely be added to the list! In summary, it's a crazy business for many, even if they have impeccably modern facilities and very large established fanbases. What's Happening With Barcelona's Finances?